Jungle Cruise was an opening day attraction in both Disneyland in 1955 and in Disney World’s Magic Kingdom in 1971. Walt Disney himself helped design and the attraction, but what we see today is pretty different from the original. 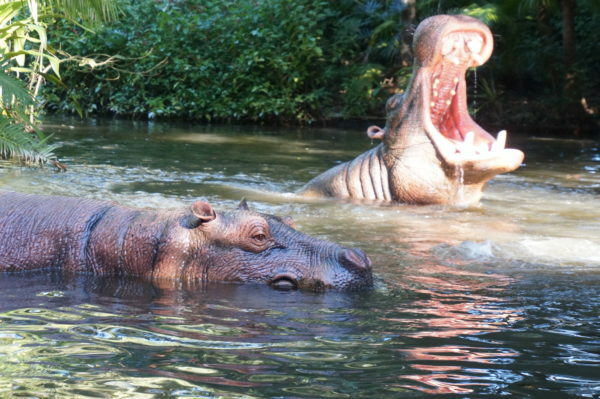 Today we’re going to take a look at 14 interesting facts about Jungle Cruise. 1. It was supposed to have live animals. When Walt envisioned Jungle Cruise, he wanted to use live animals. However, he realized that there might be some danger in using live animals in an attraction, and he couldn’t stop animals from sleeping during the day, so he decided audio-animatronic animals would be easier and safer to use. Walt’s idea for live animals didn’t go away, and later showed up at Disney’s Animal Kingdom. 2. It wasn’t always funny. Again, when Walt first created Jungle Cruise, it was more of a documentary style than the witty attraction we know today. 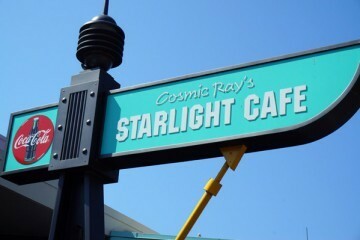 The funny scenes and silly script were added years after the attraction opened. 3. Walt promoted the attraction. While Disneyland was under construction, Walt was at the height of his career. 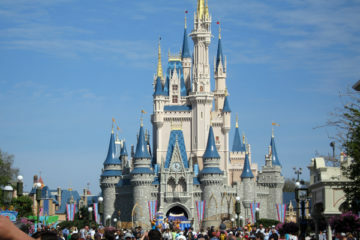 It was not uncommon to see him in television shows and commercials advertising his new theme park. Before the riverbeds of Jungle Cruise were filled with water, Walt drove a Nash Rambler (one of the attraction’s sponsors) through the dirt and passed Schweitzer Falls showing off the ride construction including the basic construction of the original animatronics. Jungle Cruise is a really interesting attraction that dates back to Walt Disney himself and his first park, Disneyland! 4. This ride inspired Walt to say that his parks will never be complete. One day, Walt was walking through Disneyland, as he often did, when he heard a young boy ask his mom to cruise through the jungle. She replied, “No. We did that last time.” Upon hearing that, Walt decided that he needed to keep changing and improve everything in Disneyland and later in all of the Disney Parks that bare his name so guests would keep coming back. 5. Some very famous people were once Jungle Cruise Skippers. Kevin Costner, John Lasseter, and Nixon’s Press Secretary Ron Ziegler all got their start at the Jungle Cruise. Lasseter, who is currently the Chief Creative Officer of Pixar Animation Studios, Walt Disney Animation Studios, and DisneyToon Studios and the Principal Creative Advisor for Walt Disney Imagineering, said that Jungle Cruise is the best ride in the whole park. 6. The exotic jungle plants aren’t really exotic. When Walt started building Disneyland, money was at a premium. He had convinced ABC, a company which Disney now owns, to put up the financial support for the park. However, due to tight budgets, he had some tough decisions to make – like whether to provide public restrooms or air-conditioning. As such, he really had to find ways to cut costs in attractions. One way that he did that was to use plants native to the area instead of shipping in plants from tropical environments. Walt and his Imagineers decided to plant orange trees upside down and let vines twist and grow around the exposed roots. 7. The water is cleaner than it looks. Disney has had some issues with dirty water in the past, so they always make sure that the water is clean. 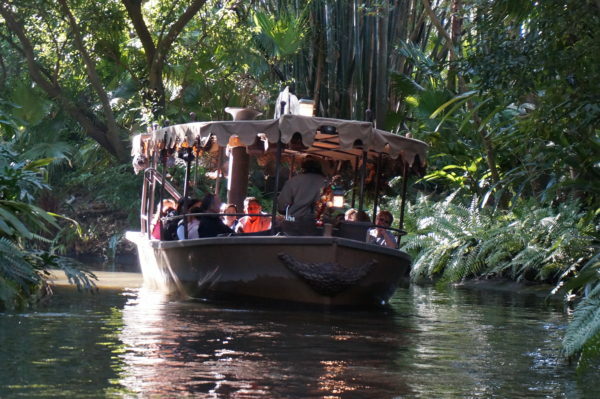 However, the water in Jungle Cruise needs to look like the murky rivers of the Amazon. Instead of using dirty water, they dye the water with brown, green, and blue. The water in Jungle Cruise isn’t quite as dirty as it looks. Besides providing authenticity, the “dirty” water also conceals the track that the cruise ships actually run on and the fact that the water is less than four feet deep in most areas. 8. 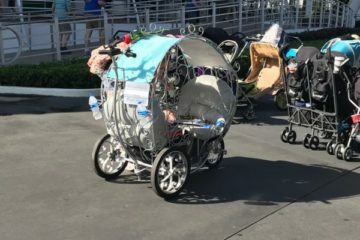 Disney recycled an airplane for the attraction. Walt purchased in a Lockheed Model 12 Electra Junior airplane and used it to scope out the land that would become Disney world. At the time, this was a pretty costly investment. 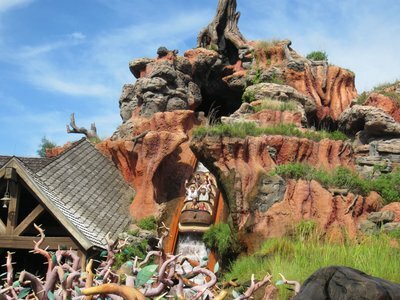 When they took it out of service, they decided that it needed to serve some purpose, so they used the back half of it for the plane crash scene near the hippo pool in Magic Kingdom. The front half of the plane was used in the Casablanca scene in The Great Movie Ride at Disney’s Hollywood Studios, which is now closed. 9. The ride is pretty low-tech. Jungle Cruise was a tall endeavor, but Imagineers actually used some pretty low-tech tricks to accomplish some really impressive effects. For example, consider how the animals’ eyes glow as you sail through the Asian temple. One might think that they used some kind of really cool technology to make that happen. However, it turns out the effect is very simple. The eyes are just made of marbles that are painted with a reflective coating. 10. The queue references Swiss Family Robinson. Just next door to Jungle Cruise is the Swiss Family Treehouse, which was also an opening day attraction in Magic Kingdom. As a nod to its neighbor, there are two shipping crates with one addressed to “Thomas Kirk, Esq., M. Jones, Cartographers Ltd. Field Office, Island of Bora Danno.” This is a reference to the Disney movie “Swiss Family Robinson” in which Tommy Kirk plays Ernst Robinson and the main character in “The Miss Adventures of Merlin Jones”. James MacArthur, who played Fritz Robinson, also played Danny Williams who is famous for saying, “Book ’em Danno” in Hawaii Five-O. The second crate says “Kenneth Annakin, Director of Imports, Wyss Supply Company, Colony of New Guinea.” Ken Annakin directed Swiss Family Robinson, and Johann Wyss wrote the book on which the movie is based. 11. One of the boats sank. Sankuru Sadie at the Magic Kingdom sank in 2004 after the boat took on more water than it could hold. Since most of the river is just a few feet deep, the boat wasn’t too damaged and no one was injured. It was refurbished and still runs today. 12. Katharine Hepburn had a cameo. 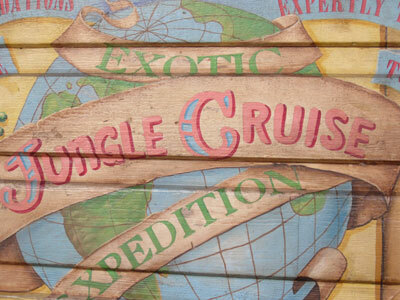 Jungle Cruise is inspired by “The African Queen”, a movie starring Humphrey Bogart and Katharine Hepburn. 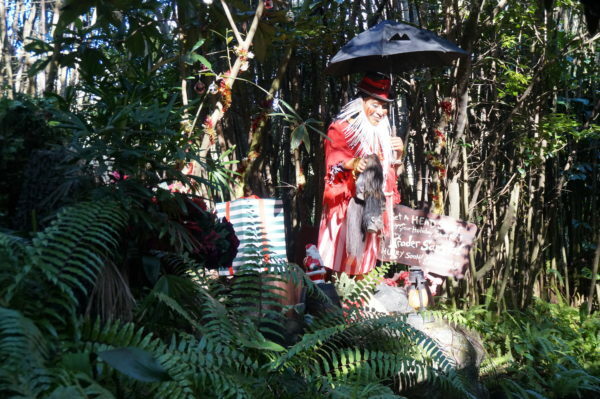 At the end of the ride, Trader Sam, a head hunter, proposes a deal with riders: “Two heads for one of yours.” Keen riders might notice that one of the shrunken heads Trader Sam is holding looks a lot like Katharine Hepburn. One of Trader Sam’s shrunken heads is a close resemblance of Katharine Hepburn. 13. It was featured in a Kodak Commercial. Ed Sullivan, from the Ed Sullivan Show, partnered up with Kodak, a long time Disney sponsor to shoot a commercial in 1959 for the new Brownie camera. Sullivan says that the camera is smart enough to shoot accurately exposed pictures in deep shade or bright sunlight and move from dark to light or vice versa very quickly and uses Jungle Cruise in Disneyland as an example of this. The hippos were featured in a Kodak commercial in 1959. 14. Some trees in Disneyland are older than the park. The Dominguez Palm, which sits just outside the entrance of Jungle Cruise in Disneyland, is a large palm tree that dates back to 1896. The palm is named after the family who lived on the property before Walt built his park. 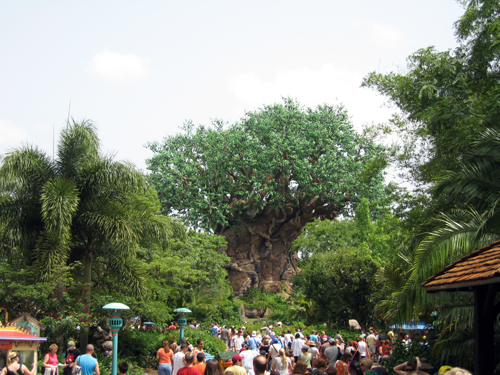 The owner, a rancher, requested that Disney save this tree regardless of what they did with the other vegetation. However, the 15 ton tree was located where Disney wanted to put the parking lot, so Disney dug it up and moved it from the parking lot to Adventureland. 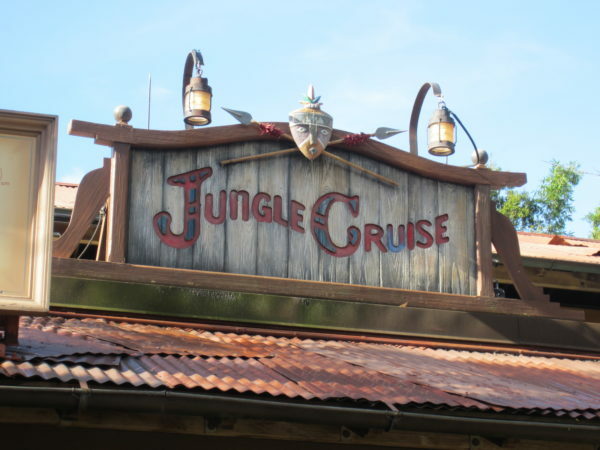 Jungle Cruise: a favorite classic or needs an update?